And it came to pass that Hagoth, he being an exceedingly curious man, therefore he went forth and built him an exceedingly large ship. At the conclusion of the extended conflict between the Nephites and the Lamanites, Mormon reported that a “large company of men, even to the amount of five thousand and four hundred men, with their wives and their children, departed out of the land of Zarahemla into the land which was northward” (Alma 63:4). Next, the reader learns that “an exceedingly curious” man named Hagoth “went forth and built him an exceedingly large ship” (Alma 63:5). “And behold, there were many of the Nephites who did enter therein and did sail forth with much provisions, and also many women and children; and they took their course northward” (v. 6). During the next year, Hagoth built even more ships, and when the first ship returned, “many more people did enter into it; and they also took much provisions, and set out again to the land northward” (v. 7). Exactly what type of ships Hagoth built is uncertain, except the description of his first ship being “exceedingly large” (v. 5). A careful reading of these events shows that in the space of two years Mormon reported at least five notable migrations—three by sea, two by land, and all of them “northward.” Although brief, Mormon’s sampling of these migrations helps the reader catch a glimpse of an expanding Nephite civilization. While nothing is said further concerning the matter, Mormon’s mentioning that “Hagoth built even more ships” implies that further seafaring migrations may have been on the horizon. The uncertainty concerning the final destination of Hagoth’s voyagers (and potentially Hagoth himself, assuming he accompanied the second journey of his ship), has captured the attention of Book of Mormon readers for generations. Several LDS prophets and general authorities have believed Hagoth’s seafarers were progenitors of various peoples of the Pacific Islands. Thus, for many Polynesians the story about Hagoth and the possibility of other Lehite voyages by sea has significantly influenced perceptions of cultural identity and heritage. Officially, though, the LDS church claims no specific revelation or position on these matters. While the fate of Hagoth’s travelers is not certainly known, the very fact that their journeys are mentioned at all is relevant to interpreting the Book of Mormon. Mormon was very selective about what he included in his narrative, which suggests that digressing into details about these migrations must have served some overarching narrative goal. Wherever they went and whatever their relationship with the indigenous peoples in the Pacific, Hagoth’s oceanic voyagers certainly open up the possibility for the Lehite lineage to have been dispersed to locations far away from the central locus of the Book of Mormon narrative. Thematically speaking, this helps readers recognize that even among the Nephites, the scattering of Israel was still taking place. Indeed, nine years after Hagoth set sail, large numbers of Nephites migrated a “great distance” to the north (Helaman 3:3), and Mormon’s description of their multiplying and spreading abroad to the south, north, west and east, uses language similar to the covenantal promise given to Jacob in Genesis 28:14, indicating that he saw these migrations as part of that larger Abrahamic narrative. Other major realignments took place during the Expansion phase. Cultural, and probably genetic, interchange continued between the main Lamanite and Nephite centers. … As the Book of Mormon narrative approached AD 30, the picture of society throughout the “promised land” occupied by Lehi’s descendants was one of factional fragmentation and perhaps increasing cultural differentiation within a highly variegated set of environments. It was evidently difficult for the component peoples to maintain stable social and cultural conditions. In other words, expansion and prosperity helped pave the way for increasing social complexity and eventual instability. Sorenson’s analysis helps demonstrate that the story about Hagoth and the other voyages northward was not merely a casual digression into historical trivia. On the contrary, Mormon (who would have had a personal interest in the land northward where he grew up) presented this information to help readers better conceptualize the largescale transportations and important transformations happening among the Nephite and Lamanite civilizations. No narrative takes place in a historical vacuum, and the better readers understand the historical backdrop of the Book of Mormon, the more real and meaningful its sacred stories will become to them. Mark Alan Wright, “Heartland as Hinterland: The Mesoamerican Core and North American Periphery of Book of Mormon Geography,” Interpreter: A Journal of Mormon Scripture 13 (2015): 111–129. 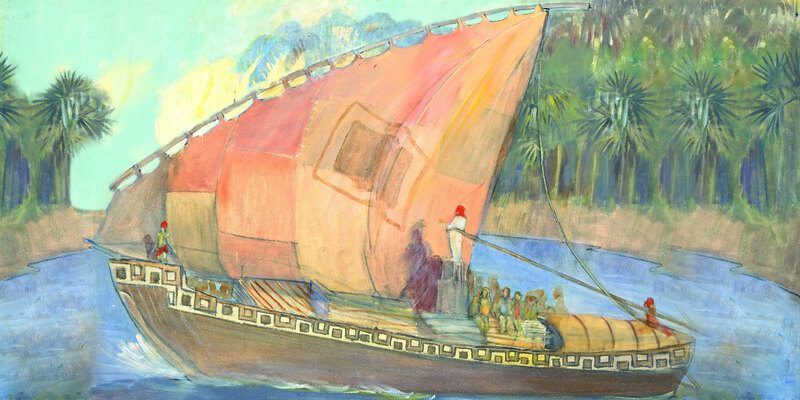 John L. Sorenson “Transoceanic Voyaging: How Ancient America Became Civilized,” (unpublished manuscript, 2013), online at bookofmormoncentral.org. Tyler Livingston, “The Book of Mormon and Mesoamerican travels ‘Northward,’” Book of Mormon Archeological Forum, January 2011, online at bmaf.org. See “HAGOTH” online at https://onoma.lib.byu.edu/index.php/HAGOTH. See also, John A. Tvedtnes, “Curious Hagoth,” Meridian Magazine: Latter-day Saints Shaping Their World, September 20, 2010, online at latterdaysaintmag.com. See John L. Sorenson, Mormon’s Codex: An Ancient American Book (Salt Lake City and Provo, UT: Deseret Book and Neal A. Maxwell Institute for Religious Scholarship, 2013), 136–137, 358–360, 630–631, for a proposal of possible ship constructions as well as Hagoth’s departure location. Alma 63:9 could be argued to be somewhat ambiguous as to the mode of travel: “And it came to pass that in this year there were many people who went forth into the land northward.” Within the immediate context of sea voyages and the building of more ships, it’s possible to assume that the people who “went forth” were actually sailing forth. However, it should be remembered that land migration is also part of this context (v. 4), and that Mormon had just reported that “one other ship also did sail forth; and whither she did go we know not” (v. 8). After this he introduced the next details about migration with the phrase “And it came to pass” which often acts as a marker between separate ideas (v. 9). It would seem odd for Mormon to explicitly mention “one other ship” (which sort of has a tone of finality to it) and remark upon its uncertain fate, and then report an additional seafaring journey without even mentioning that it was by ship. Because of the difficulty of such a reading, it seems much more likely that this chapter’s final—though unspecified—mention of a journey northward was by land rather than by sea. This point is relevant because two northward land migrations within a short period of time holds greater implications for Nephite territorial expansion. For an analysis of the term “northward” as used in the Book of Mormon, see Brant A. Gardner, “From the East to the West: The Problem of Directions in the Book of Mormon,” Interpreter: A Journal of Mormon Scripture (2013): 148–149; John L. Sorenson, Mormon’s Map (Provo UT, FARMS, 2000), 78–81. See also, Book of Mormon Central, “Why Did Mormon Give So Many Details About Geography? (Alma 22:32),” KnoWhy 130 (June 27, 2016). For a treatment of oceanic voyages in the Americas, see John L. Sorenson “Transoceanic Voyaging: How Ancient America Became Civilized,” (Springville UT: Book of Mormon Central Archive, 2013), 11–14; See also, Sorenson, Mormon’s Codex, 150–172. There is textual ambiguity as to whether or not Hagoth actually boarded any of his vessels. Alma 63:7 reports, “And in the thirty and eighth year, this man [Hagoth] built other ships. And the first ship did also return, and many more people did enter into it; and they also took much provisions, and set out again to the land northward.” From this sparse statement, it simply cannot be determined if Hagoth himself was part of the “many more people” who again sailed northward. Russel T. Clement, “Polynesian Origins: More Word on the Mormon Perspective,” Dialogue: A Journal of Mormon Thought 13 (Winter 1980): 91. See Clement, “Polynesian Origins,” 92–97; Robert E. Parsons, “Hagoth and the Polynesians,” in The Book of Mormon: Alma, the Testimony of the Word, ed. Monte S. Nyman and Charles D. Tate Jr. (Provo, UT: Religious Studies Center, Brigham Young University, 1992), 250–258. Studies in Honor of John L. Sorenson, ed. Davis Bitton (Provo, UT: FARMS, 1998), 245–276. Grant Hardy, Understanding the Book of Mormon: A Reader’s Guide (New York, NY: Oxford University Press, 2010), 207. For possible linguistic connections related to Hagoth’s voyagers, see Brian D. Stubbs and John L. Sorenson, “Was There Hebrew Language in Ancient America? An Interview with Brian Stubbs,” Journal of Book of Mormon Studies 9, no. 2 (2000): 62; Brian D. Stubbs, “A Few Hundred Hints of Egyptian and Northwest Semitic in Uto-Aztecan,” presentation given at the 2006 FairMormon conference, online at Fairmormon.org; Brian D. Stubbs, Exploring the Explanatory Power of Semitic and Egyptian in Uto-Aztecan (Provo, UT: Grover Publications, 2015), 359–362. For example, Nephi discussed the scattering as something that would happen “sooner or later” and elaborated upon “all those who shall hereafter be scattered” (1 Nephi 22:3–5). For indications of increasing prosperity tied to migrations and free commerce, see, Helaman 6:6–9. As is implied in Mormon 1:6. For possible implications of northward expansion, see Mark Alan Wright, “Heartland as Hinterland: The Mesoamerican Core and North American Periphery of Book of Mormon Geography,” Interpreter: A Journal of Mormon Scripture 13 (2015): 111-129; Tyler Livingston, “The Book of Mormon and Mesoamerican travels ‘Northward,’” Book of Mormon Archeological Forum, January 2011, online at bmaf.org. Another possibility is that the Book of Mormon takes some pains to demonstrate how the record made it from person to person, Nephi to Moroni. In the same passages where Hagoth's endeavors are mentioned, Corianton is also mentioned as one who traveled aboard one of the ships. He would have been a potential successor to Shiblon as the keeper of the record and other sacred items (Alma 63:10). Absent Corianton, the next in line for that responsibility would be Helaman, the son of Helaman (Alma 63:11). We have been told that some day we will receive other records of other peoples separated by the Lord. Maybe some day we will receive a record kept by these people that will tell us what happened to them. If so, it would be another proof of the Book of Mormon.